Doceri 2.0 is a free upgrade for anyone that previously purchased the software. When you upgrade, the license key should automatically transfer over. If it does not, please submit a support ticket. Upgrade Doceri Desktop on your computer. For IT Admins and secure corporate networks: The default Doceri port number has changed to 7019. Please read this help document for more information. Read the Doceri 2.0 Keys to Transition below, or download the PDF document for future reference - there are important differences that will be in effect as soon as you upgrade. Our users have been the greatest source of feedback and inspiration for Doceri. You asked for a host of new features and we listened. After countless hours of development the new Doceri 2.0 is ready for you. With your help, we’ve created something we feel is truly special and we hope you agree. We’re committed to creating the best software for creating professional drawings and hand written presentations, turning your iPad into an interactive whiteboard and now also for recording and sharing what you’ve created as a screencast. We hope that once you’ve started using the new Doceri, you’ll take the time to rate us in the iTunes App store and refer your friends and colleagues. We believe in making all the features of Doceri available to try - free - before buying. The app is still free to download in the iTunes App store, and Doceri Desktop is still free to download and try here on our Web site. The complete list of "what’s new in Doceri 2.0" is highlighted on the Doceri Freedom to Teach Blog. Please make a comment and let us know what you think! IMPORTANT: Both Doceri on the iPad and Doceri Desktop on the host computer must be upgraded. The Doceri 2.0 app requires Doceri Desktop 2.0 for remote desktop control. Doceri 2.0 will not respond to Doceri Desktop 1.x, and the existing Doceri Remote 1.x app will not respond to Doceri Desktop 2.0. You must upgrade both the app and the desktop software to continue to use remote desktop control. With all the great new features we’ve added to Doceri 2.0, you’ll certainly encounter a few changes to the way you’re used to working with Doceri. We’ve prepared this transition guide to help you quickly identify the most important changes so you can get up and creating right away. The first change you’ll see is the option to start creating a project on your iPad without connecting to Doceri Desktop. This is the biggest functional change in Doceri 2.0, which also paves the way for several other major changes including screencasting and a new way of saving and interacting with your Doceri project files. With Doceri 2.0, you’re no longer limited to a single background within a multi-slide project. This necessitated a change to the way the screen wipe and new slide/page tools function. The screen wipe tool , formerly created a new page in Doceri 1.x. In Doceri 2.0 this screen wipe tool now ERASES all visible strokes and images from the current screen. This action can be reversed with the undo tool as long as you haven’t moved the slider on the timeline. When the Timeline is closed, the forward slide (or page) icon moves to the upper right corner of the project screen and the back slide (or page) icon moves to the upper left. When at the end of a project, the forward slide icon will create a new slide or page. With the timeline open, touch the white new slide icon from anywhere within the project to create a new slide (or page). Each new page can be customized with a different background. We’ve reduced the complexity of gestures for basic mouse control when connected to Doceri Desktop. The mouse magnifier has also been disabled. If you prefer the old method of mouse interaction, you can return to it by turning on the use advanced mouse option in the Doceri 2.0 settings menu. In Doceri 1.x, the pointer [insert arrow pointer] was available through its own mode button. In Doceri 2.0, the pointer is now available in both Annotation and Control mode. To use the pointer, rotate the iPad to portrait view and place your finger in the top portion of the screen. Tap to the left of your finger to change the pointer style or tap to the right of your finger to rotate the pointer icon, just as before. Because Doceri 2.0 works with or without a connection to Doceri Desktop, Doceri project files can be located and manipulated in both places and they can be copied to and from each location. We highly recommend storing Doceri projects on the iPad so they can be accessed from anywhere you choose to work. 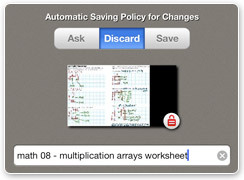 When you are not connected to Doceri Desktop, Doceri will save continuously and automatically on the iPad. When you access an existing file that has been saved on the computer, Doceri will save only when you exit the project to the same location on your computer. New Doceri projects created while connected still save locally to the iPad. By default, Doceri saves annotations locally on the iPad as a new project when connected to Doceri Desktop. 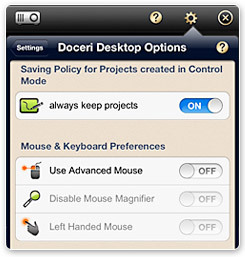 If you do not wish to save annotations, you can change the setting Always Keep Projects in the Doceri iPad Settings under Doceri Desktop Options. In Doceri 1.x, custom backgrounds were accessed from the Quick Launch Folder on the computer running Doceri Desktop. In Doceri 2.0, custom backgrounds now reside on your iPad and can be easily created within the Doceri project screen using drawings, photos or any image captured from the computer running Doceri Desktop. Note: existing backgrounds located in the Doceri Quick Launch folder on the computer running Doceri Desktop will need to be transferred to the iPad. See our knowledge base article on Transferring Custom Backgrounds to the iPad.